How To Open Your Heart To Love. Opening the heart to love is a matter of perception. It can be an easy process or an impossible one to achieve. Although there's not a particular order in the steps one has to follow; awareness is needed, as well as a strong intention. When the intention is strong, obstacles become simple anecdotes fairly easy to overcome. Intention ignites passion. 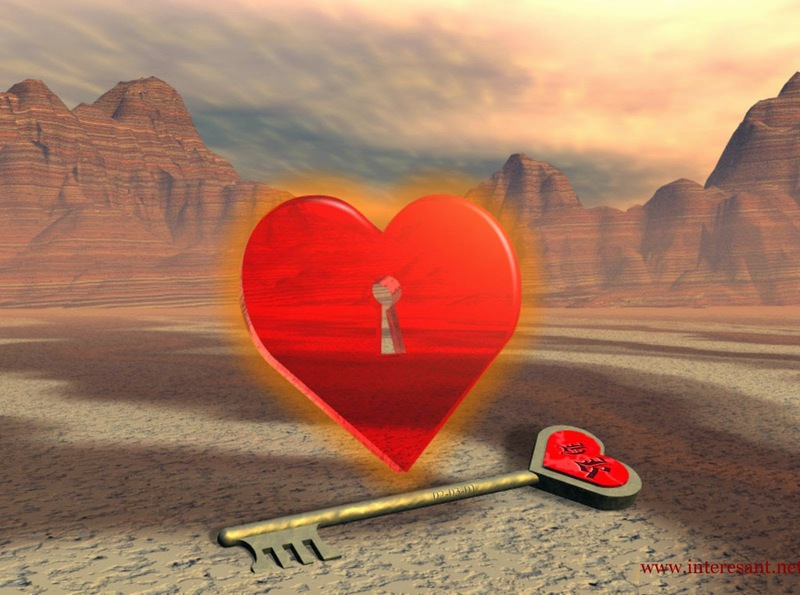 Miracles do happen when someone is on a personal quest to open their hearts and find love within. When the intention is strong enough, passion becomes a healthy ally. Mistakes will be made, even if we are moved by the best intentions. Don't beat yourself up. You are human and mistakes are part of being one. Within every mistake, there's a lesson to be learned. The awareness that is required lies in the wisdom found within each mistake. Let's drop any ideas of perfection we may have and any sense of self-importance. A paradigm shift can only take place when we let go of old beliefs. Trying to be perfect, we forget we already are. Embrace your mistakes and flaws. We all have them. Focus instead on your intention. Awareness will help us to make the choices that lead to an open heart. When a strong intention is set, we are also opening ourselves to courage. Courage is always there, but as most of humanity lives in permanent state of avoidance, we don't use it and we don't know it. Tap into it and own it. It belongs to you. Love is everywhere around us, yet, we find it difficult to recognise it even if it's standing right in front of us. This is where choice and awareness play an important part. It could the be case that you are not providing enough love for yourself. This is represented in your immediate environment. Your home, your room, your fridge, your clothes, your job, your relationships and everything else that forms part of your reality. Pay attention to your words and thoughts. Are you set on a cynical mode in which possibilities are limited and based on what you see directly? If this is the case, it is OK. If your intention is strong enough it will also change this perception. To open your hear to love, you must go where you would not normally go and see those things in front of you that you can see. Let's begin with our surroundings and a practical example. As you go out of the house in the morning, observe people's homes or gardens. Abundance of love and care has been put into arranging a comfortable home. Look at people and what they do. If visiting a public place -a coffee shop is a good example-, pay attention to the smiles and greetings you will meet. Be prepared to receive. Even better if you begin the day with a smile. Breathe. Pay attention to yourself and your body. What is it that you want and what are you expecting? To open your heart, you must be able to see and appreciate those signs of love even when they're not directed a you. A couple going to work together. Parents showing affection to their children. If you look for it, you will see hundreds of examples every day, but these are actions that we take for granted, and as they don't have a direct effect on us, we tend to overlook them. It's not easy to see the magic of life unless we're tuned in. The fact that we are presented with the same scenario every day in our daily routines does not help to see it. But it's there. It's always there. Perhaps it's not touching you directly, reason for which you might not be paying attention. Once you see the first one, you will see more taking place. When witnessing these episodes, take a deep breath and take it in. You are witnessing love. Celebrate with a smile. It might seem mundane, but these are the signs you are looking for. There is also a need for action. Years ago I went to a retreat. My feelings were divided between scepticism and hope. My only reference about the program they provided came from a friend who told me that they were very good. While I had little or not trust in others doing anything good for me, I also felt compelled to be there, so much so, that I borrowed money to pay the entire fee. The retreat was facilitated by Claudio Naranjo and the wonderful members of his staff. I didn't know who Claudio was then. As we arrived, it was easy to recognise anxiety in everyone at the moment of introductions. I didn't know what I was doing there or what I wanted, but I was desperate enough to jump at anything that might help me to feel better. Intuition played an important part to take me there, as well as to make decisions that would soon change my life. First, I was determined to succeed. With this in mind and heart, I decided that I would do my best at anything they asked from me and that I would work with whoever wanted to do an exercise with me. The first exercise was of course with another sceptic. It was perfect. There were people in the group to whom I would have never approached in my life. In fact, I would have avoided them on purpose, never getting to know who they were if given the chance, but I had already set a strong intention. Instead of asking those I would have rather spent time with, I allowed people to come to me and ask me first. I always said yes. When I tried to do an exercise all by myself, I had to work and help with the person I wanted to work the least with. But when we worked together, it was an amazing experience and my perception of them changed completely. The reason why I didn't want to have to do anything with them had nothing to do with them, but with me. They all had traits I didn't want to recognise in myself, depression, sadness, anger, hate or arrogance. At this stage it is important that we use courage and admit to our own truth and deal with it rather than avoid it. What happened next was magical. As the days advanced and the exercises and exchanges took place, magic happened. Not only my heart opened to love, but also the hearts of others. The more I worked with people I would have avoided, the more the heart opened, until there was nothing in anyone else to dislike. Within two days and even sooner, I was a new man. One of the exercises was with a man suffering from depression. It was such a powerful moment, as we helped and supported each other, that even other participants commented on how amazing our connection had been. And that was all it took, acceptance, connection and intention. After that, we both had a reason to rejoice. And this man no longer represented depression in my eyes. The account I have given takes place in a retreat which is designed for the purpose of healing. Not everyone has this opportunity at any given time, so we must pick different places and our battles. Although we are not presented every day with such opportunities, these moments and possibilities can be found in our daily routine, and it could be as simple as trying to see the person who every morning serves us a coffee with a grudge. See the person, the soul, not their actions. Let's stop judging one another. We never know what others are going through and why they behave as they do. Be the first one to promote change by taking action. Smile, talk to them and try to establish a simple connection until that person is no longer a stranger. The same applies to working spaces where we are presented with such opportunities daily. Be the one to promote change. Take the initiative. If you set your intention high enough, these steps, however challenging they might be, are also very encouraging. Do not be afraid to show others that you've changed and improved. Move from being detached to being a magnet to good things. If in doubt because of what other people might think of you, ask yourself a question. Would you rather people thought of you as the one who holds grudges and remains the same or as the one who changed into your real self; a man, a woman, a soul with an open heart? Look at people's eyes, rather than at what they do, what they look like, where they work or how they dress. Find something to praise. Help them. Everyone is looking for love even if they don't admit it. It's easy to argue that we don't need love when we believe we can have it. The truth is that you can have it. This is a daily practice. Do this for a week and see how your life changes. Forget and forgive. And above all, forgive yourself. If you were interested in healing or self-improvement you might want to consider whether you'd like to spend your next holiday in an exotic place of choice or attending a retreat where you can work on yourself and meet new and wonderful people. In my experience, no holiday has had the effect on me that these retreats with Claudio Naranjo offered. Pick your retreat, therapy and following your intuition choose those who might be able to help you. This is not advertisement. I don't work for Claudio or have no personal/financial interests in his affairs. I am sharing this information because Claudio, his staff and methods had a great influence in the man that I am today, and the more of us to heal, the greater the effect we all will have in the world. Claudio organises events in different parts of the world. As you advance in the journey, opening your heart to love, you will see more and more miracles. This is only a small guide to where to look and what to look for. In the end, what matters is your experience. You might want to look at it from a different perspective. Men, Women And The Divine Feminine.